A deck railing can serve a greater purpose than just providing safety and structural support. 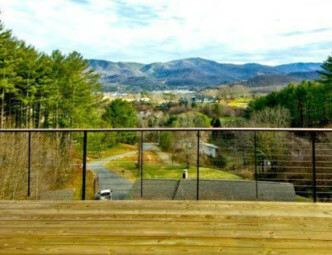 A new deck railing can also dramatically enhance the appearance of your home or business’ exterior. 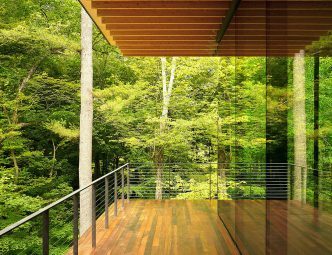 Unfortunately, many railing designs obstruct the natural view from the deck they enclose. Keuka Studios, however, designs our railings with your home’s unique surroundings in mind. 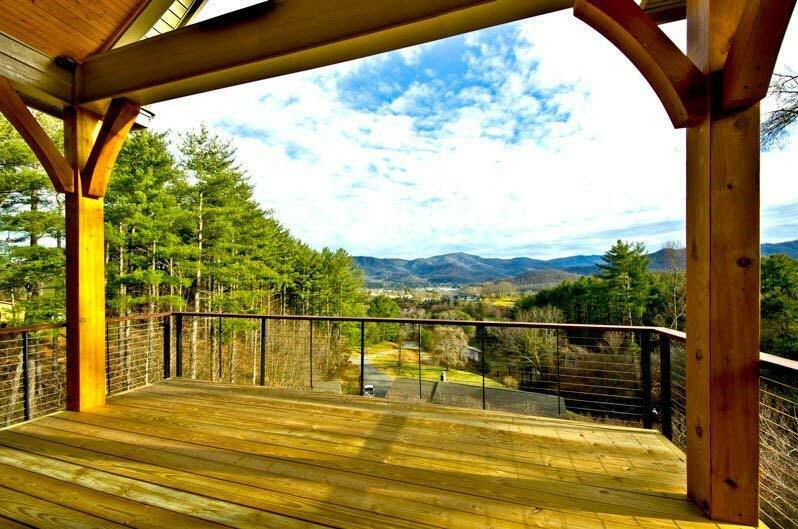 We specialize in deck cable railings that preserve natural views, match virtually any architectural style, and require very little maintenance. 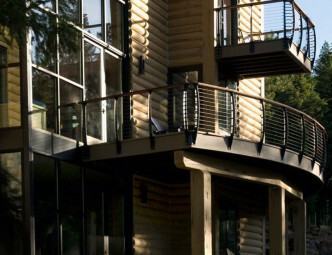 Our deck railing designs meld form and function. Keuka Studios meticulously crafts each baluster and post to offer maximum stability and strength without sacrificing beauty. To conform to your deck’s existing structure or to match your preferences, we build both fascia-mount and surface-mount railing styles. We offer a wide variety of post styles, top rail styles, materials, and material finishes to create the perfect deck cable railing that complements the architecture of your home or business. To learn more about purchasing a deck railing, read our railing design process and the building codes. If you want a clean, minimalist design to enhance the beauty of your deck’s surroundings, our Ithaca Style cable railing boasts an industry-leading ½” intermediate post design. This unobtrusive railing style won’t block your view and because of its simplicity, it matches almost all architectural styles. We also offer optional ultra-thin cable spacers to create even more space between intermediate posts. 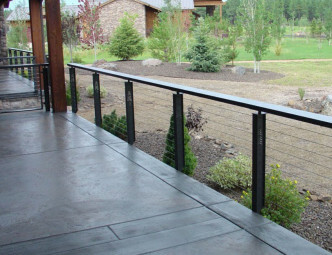 To achieve a more contemporary look, consider a Tokyo Style deck cable railing. This post design marries a sleek profile with strong, sharp lines that are quintessential to modern architecture. Our Keuka Style post design has a bold, stylized look and a nautical feel. 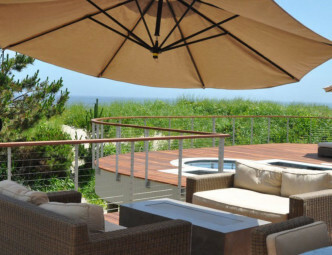 The graceful curves of the posts perfectly complement beach and maritime settings. 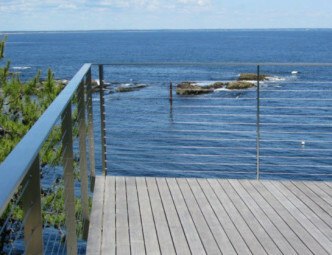 Because of its careful design, a Keuka Style deck cable railing will require very little maintenance even in harsh seaside environments. 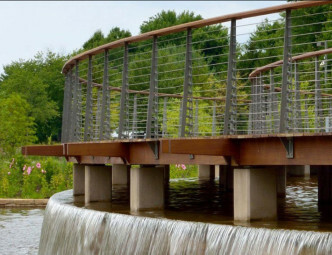 At Keuka Studios, we pride ourselves on manufacturing beautiful and functional cable railings for interior and exterior applications, stairs, and decks. Browse our gallery of design ideas, check out our pricing page, or contact us to discuss designs and request a quote.